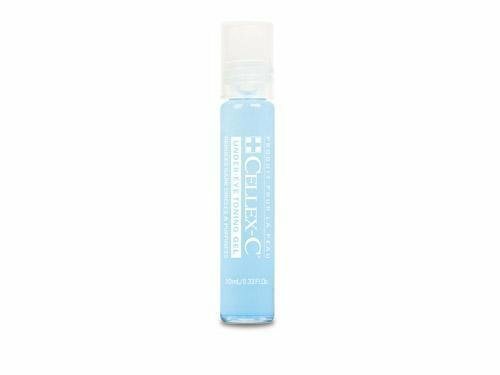 Reduce dark circles and puffiness in a wink of an eye with Cellex-C Under-Eye Toning Gel. Azulene, the German chamomile flower, works to soothe tired skin and combat the inflammation that leads to dark under-eye pigmentation and congestion while peppermint leaf extract cools on contact to relax your skin and relieve stress. Proprietary plant complexes work together to tone the delicate under-eye area and reduce the appearance of crows feet and crepey skin. Cornflower (Centaurea Cyanus) Extract, Glycosaminoglycans, Beta Glucan, Kigelia Africana Extract, Zinc Sulphate, Azulene, Lavender (Lavendula Angustifolia) Oil, Rosemary (Rosmarinus Officinalis) Extract, Thyme (Thymus Vulgaris) Extract, Olive Leaf (Olea Europaea) Extract, Eucalyptus (Eucalypus Globulus) Oil, Peppermint (Mentha Piperita) Extract, Cucumber (Cucumis Sativus) Extract, Phenoxyethanol, Polysorbate 20.